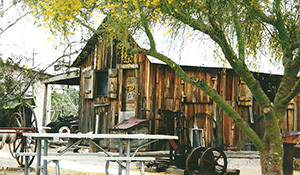 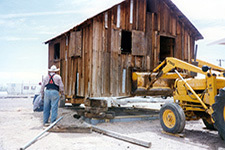 The mining shack is believed to have been built about 1910 in Swansea and was moved initially by Bud Muse and later to his house behind the Ocotillo Lodge. 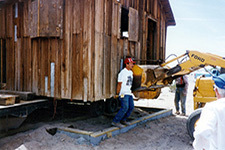 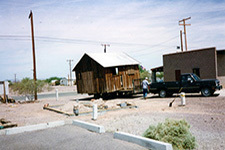 The shack was later donated to the Bouse Chamber of Commerce by Roland and Adele Miller in 1997. 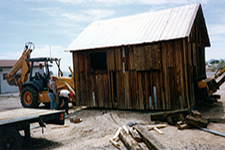 When the Bouse Chamber of Commerce made the decision to utilize the Assay Office as a museum they also started housing mining equipment. 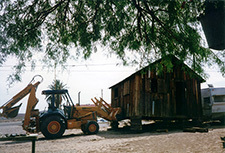 They brought in several pieces of old mining equipment and moved the old mining shack to its present location beside the Assay Office. 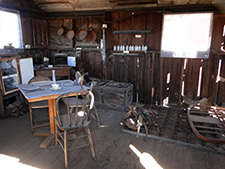 Thus creating a place where visitors can see what miners and their family lived in as they worked the mine.